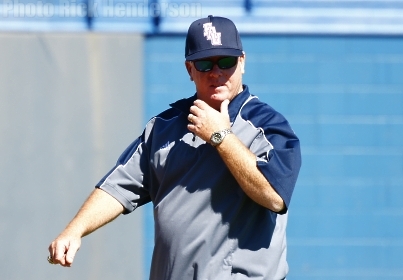 Florida Atlantic University baseball head coach John McCormack has his team on a collision course with the NCAA Tournament once more and has earned a four-year contract extension through the 2020 season. “I first want to thank Dr. Kelly, Pat Chun, and the rest of the administration for having the faith in me to continue to lead the program,” McCormack said. McCormack has led FAU to 30-win seasons seven times at the helm with 273 wins, averaging 34.7 wins per year going into the 2016 campaign. McCormack has produced 18 MLB draft prospects as a head coach and 95 professional players in his 26 seasons combined at FAU. This year, his Owls boast a 30-12 and a No. 17 national ranking, sitting among the top teams in Conference USA. The Owls have also earned three wins over top-five programs (Mississippi State twice, Miami).